This evening Cooter, who has been a little puny with the sniffles today, came and sat next to me. He wanted to show me a video he found. This video showed row by row a display of every Star Wars Lego minifigure ever made. Then you know what, buddy? It matters to me, too. That’s pretty much how this whole things works. A few minutes later (did I mention it was ten minutes long?) he pointed out Darth Maul in a Santa outfit. Wait. What? “Nooooo, that is not okay,” I said. 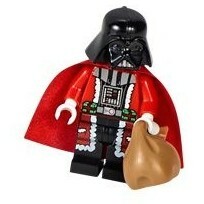 A minute later there was Darth in a Santa suit. And in that moment, I loved Star Wars more than I ever had before. Thank you, Star Wars, for teaching my son that there is good to be found even in the most broken of people and situations. Thank you for helping him look for that and see it. Tonight I’m thankful that my little guy still wants to sit next to me, and that he wants to share things with me that matter to him. That is a gift which I am trying not to take lightly. Even when the music begins to repeat over and over and I get dizzy from trying to read the nameplates underneath ten minutes of Lego minifigs. I am thankful for that gift. And just in case y’all have ten minutes and nothing AT ALL better to do, here’s the video so you can watch it too. Wishing you all the eyes to see good in just about everybody. So sweet. There’s a lot we can learn from kids . . . But were usually just too busy to listen. Well . . either that or we’re to arrogant to realize they have a lot to share too. You sit next to the fancy famous movie star . . . I’d rather sit with the kids.